But treatment isn't FDA-approved, so insurance companies might not cover the cost. (HealthDay)—The majority of women with fibromyalgia who underwent hyperbaric oxygen therapy—best known for treating "the bends" in scuba divers—experienced relief from pain and other symptoms, a small study found. But health insurance or Medicare are unlikely to cover the cost of hyperbaric oxygen therapy for fibromyalgia at this point, since it's not one of the FDA-approved uses. According to the Duke Center for Hyperbaric Medicine and Environmental Physiology in North Carolina, the total cost of the 30 to 60 treatments required for most conditions can approximate that of a major surgical procedure—tens of thousands of dollars. 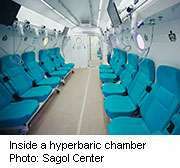 More information: The U.S. National Library of Medicine offers more information on hyperbaric oxygen therapy.